user warning: Table 'drupalgastronomer.comments' doesn't exist query: SELECT COUNT(*) FROM comments c WHERE c.nid = 134 AND c.status = 0 in /home/dgabriner/gourmetgastronomer.com/modules/comment/comment.module on line 992.
user warning: Table 'drupalgastronomer.comments' doesn't exist query: SELECT c.cid as cid, c.pid, c.nid, c.subject, c.comment, c.format, c.timestamp, c.name, c.mail, c.homepage, u.uid, u.name AS registered_name, u.signature, u.picture, u.data, c.thread, c.status FROM comments c INNER JOIN users u ON c.uid = u.uid WHERE c.nid = 134 AND c.status = 0 ORDER BY c.thread DESC LIMIT 0, 50 in /home/dgabriner/gourmetgastronomer.com/modules/comment/comment.module on line 992. 1. Put the rice and 1 c milk in a bowl to soak. Try to soak 1 - 2 hours. The rice will plump up significantly. 2. Drain rice and reserve milk. 3. In a pot on med/high, melt butter and saute drained rice for 3-5 minutes. Try to keep the rice moving to prevent from sticking. Try and brown the rice. 4. Measure out 1.5 c of milk using the reserved and fresh liquid. Add milk, vanilla, sugar, and coconut ( if desired) to the pot. Bring to boil. Cover and reduce to simmer for 25 minutes. 5. Adjust to taste with honey and cinnamon. More pics! 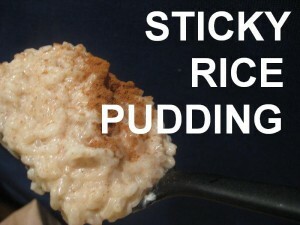 More recipes on sticky rice!